Consumerism - the Eighth Deadly sin. I had to do a bit of research for this one. I understand the idea of seven deadly sins and they all have modern day connotations. Gluttony - can lead to obesity - which can lead to complicated health problems and early death. Naturally - you would have to allow a little grace when considering that the fast food industry and soft drinks manufacturers have made it very easy to become obese. That takes me to Sloth. I am not naturally a lazy person. I am seldom seen without a tea towel at parties - I rarely relax even at home if there is washing up, a dirty floor, ironing in the basket. I find it hard to understand how anyone can. I live in an active family of sports professionals, hard workers and very busy children. Sloth is just not in our genes: Vanity may be though. My father was a very handsome man. He was always dapper too. Mum says he used to look in the mirror, comb his hair and moustache and tell her what a lucky woman she was to have married him. I am not fond of the mirror. I like to look attractive but I wouldn't have half as much fun if I worried about my appearance all the time. My roots haven't been done since June and no one has commented. I sometimes think that I am invisible. Then there is Pride. I wrestle with this one. Surely - if you have worked hard to achieve - to be at the top of your game - earned the rewards for your tenacity and determination - surely after all that striving we are entitled to be proud. Aren't we? Maybe not. Envy - I have to admit this one. There are people whose traits and abilities I envy but I consider that the ability to recognise that there are people to admire, people to learn from and emulate is a good thing. Envy without purpose is a destructive force but we all need someone to admire, to be our role model. For me a teacher, a dancer, my Godmother, my sister and a wonderful poet. I have envied them all for their talent, their resilience, their patience, their creativity. For me envy is a force for good. Greed. I am not greedy but then I have never been a 'thing' person. I take my pleasure in more ethereal pursuits. I like to take part in life. I dance, sing, go to workshops, help at fundraisers and I have nothing in my home that I don't need apart from gifts from others. I don't part with them. I collect pretty little jugs but I only have five. I am definitely not greedy. Oops - I forgot about gloves. I have a few more pairs of gloves than I need but my hands (and feet) get very cold. I am a bit greedy when it comes to gloves. Forget about all those clothes - most of them are charity shop finds - recycled - part-worn - pre-loved - vintage. There is very little in the shops that doesn't fuel global warming. When I buy new, I like to buy 'British', often more expensive but quality is an investment. Here we are - I really get Wrath. I understand anger but it is such a waste of energy and time. My brother once said to me, "Don't get angry - get even." It is an interesting idea and one that seems to work for me, however - I believe that Karma has a way for interceding to put the universe to rights. At least it does seem to happen in my world. I am not convinced that it works as a global phenomenon. I have been around for nearly 60 years and have witnessed too many cruel, unpunished humanitarian catastrophes to believe that everything will come right in the end. Unfortunately I now believe that the constant bombardment of bad news into our relaxation time is causing national depression. It is all too much to cope with. It is enough to make anyone angry. Seven Deadly sins - an idea first bandied about by the Greek philosophers, tampered with in the Middle Ages by monks, apparently each of them is punishable in hell by a particularly nasty outcome. Well my little rampage through the list has told me that I am not all bad. My Dad used to say that there was only one perfect man and look what they did to him. However, it is the purpose of this blog tell you what I consider should be the eighth deadly sin. Well that is very easy because it runs unseen through the original seven. Consumerism is the root of all evil. We make too much stuff. We buy too much stuff. We buy stuff that has no practical purpose. We buy stuff because we envy the stuff other people have. We buy stuff from all over the world that is made under appalling working conditions, where people survive on subsistence incomes to make other greedy people rich. We buy stuff that has to be transported to our door, using planet polluting fuels. We buy stuff that destroys our planet because it cannot be destroyed. We are greedy, vain, lazy and we think that possessions, how we look, where we are seen and what we wear is more important than the welfare of others and the welfare of our world. Let's stop and think this year. Do we need to buy any more plastic? Do we need to import so much fashion clothing? Do we need so many new gadgets? I am all for having a party, a family celebration - Winter would be a long, cold, boring season without Christmas but surely one thoughtful, longed for gift is adequate. One gift made by a local artist, something you make yourself at an art workshop or craft club - isn't that giving love instead of a 'buy two get one free' gift set that says so little, languishing in the back of a cupboard until the end of days. Why not go to a local gallery and buy a handmade card? Look at labels before you fuel over-production in countries that don't care about the effects of global warming. Shop politically, buy Fairtrade goods and food. I once cleaned a friend's house as a Christmas gift: She had five year old twins and was thrilled. Buy less. Be mindful. Be the difference. Care about the world but sometimes just turn off all the bad news and enjoy the here and now. Today may be the best day you ever have. 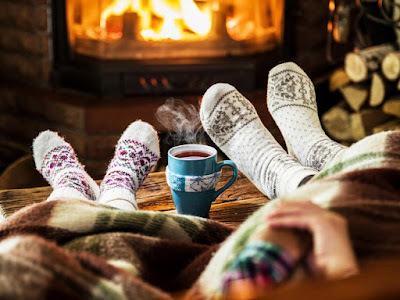 Hygge - the Danish way of getting cosy. It’s better for my knees. Like flags in billowing rows. Disconnect the World Wide Web. Let’s make socks for bed instead. eat a picnic near the Priory. Read some poems we can share. Put fresh bread on the toasting fork. snuggle together in the big arm chair. There's a lot in what you say - and I agree with most of it... though I'm not a fan of socks in bed! I love "Awaken with the sunrise, Sleep sweetly when it's dark" and the importance of not getting out of synch or too far removed from the cycles of the 'natural' world which sustains us. Give us a big hygge!